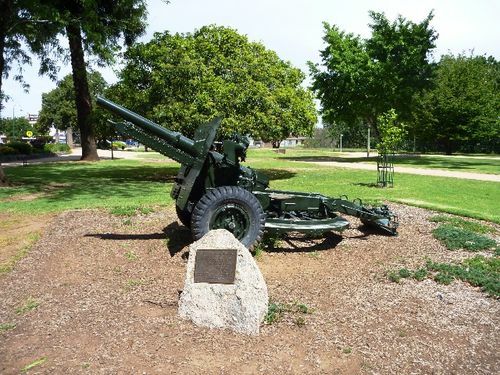 A 25 pounder artillery piece commemorates the men and women who served in World War Two. This Australian built 25-pounder gun was presented to the people of Wellington by the R.S.L. Sub-branch on 6th November 1992, to commemorate all those Wellington and servicemen and women who served in the Second World War 1939 - 1945. The 25-pounder was used to effect by Army FIeld Artillery units in both the Middle East and South West Pacific theatres of operation. It could fire an 11.3 kg (25 Pound) high explosive projectile to a maximuim range of 12,260 metres (13,400 yards) and had a crew of six. A total of 1,527 were built in Australia from 1941 to 1943.